Light Weight...Only 6 Pounds! 4.5" D x 7.5" W X 15" H comfortable handle and shoulder strap, wall mount hook for easy access. Easy reading constant supply gauge always viewable through window (other units must be turned on to activate supply gauge). 40 minute supply @ 6 liters per minute, 246 liter aluminum "C" cylinder refillable, low cost universal CGA 870 pin-index valve, simple external 2 step instructions inhalator: administer supplemental oxygen for a breathing victim. 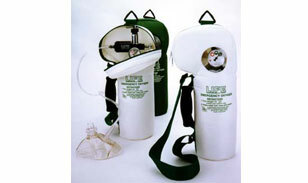 Resuscitator: oxygen enriched mouth-to-mask CPR for a nonbreathing victim. MODEL# Description LIFE-2-6FF 6 LPM Fixed Flow LIFE-2-612 6 & 12 LPM ("NORM" & "HIGH") Allows "HIGH" setting for 100% inspired 02 LIFE-2-025 0 to 25 Variable Flow (for EMTs) 12 flow settings-0, 0.25, 0.5, 1, 2, 3, 4, 6, 8, 10,15,25 LPM. LIFE® CPR Mask invertably fits both ADULT and CHILD (patented). One-way valve and filter provide hygienic protection which eliminates transmission of vomitus and contagious diseases. Crimp Proof 02 Hose. Price includes all shipping costs.